Last night we screened a Work-in-Progress cut of PGS – Intuition is your Personal Guidance System at the International Holistic Medicine Summit in Kansas City, Missouri. Dr. Norm Shealy, a legend in the field of Holistic Medicine and medical Intuition, introduced me and the film, and I have to say the screening could not have gone better. It seemed the film held the audience right from the get-go, and at the end there was long and loud applause, with a few people even giving the film a standing ovation! And a huge relief for me! Later there was a Q&A, and most of the audience stayed for that. Afterwards, in private conversations with some of the audience, Jennifer and I got some valuable feedback which we will take back to the editing room for further tweaks. 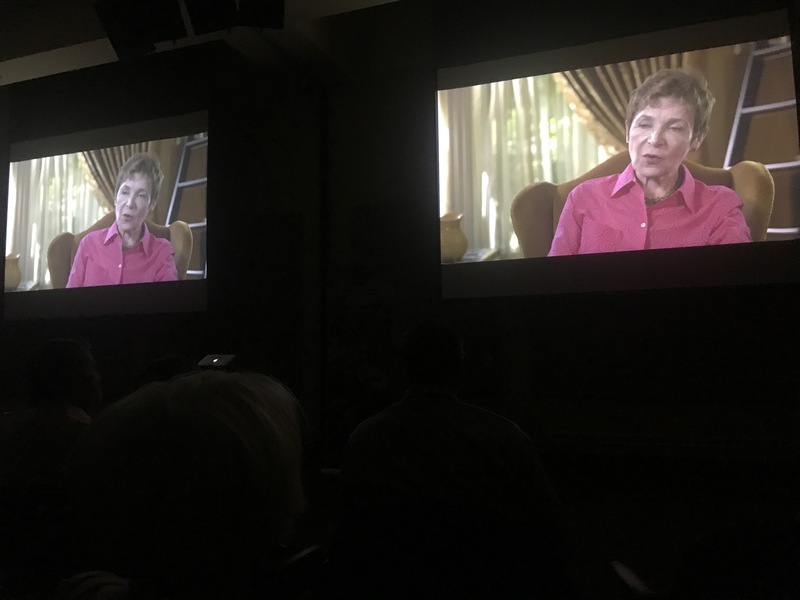 Most importantly, before last night’s Summit screening we held a private screening of the film for Caroline Myss and Norman Shealy. They both loved it! Caroline in particular was very generous in her praise – and if you know Caroline Myss, that means something! Later, I wondered why I had been so anxious about Caroline’s response to the film. It’s because she has such a finely tuned radar for anything that is false, grandiose, ego-driven, self-serving, or in any way inauthentic. She is fierce and withering in her condemnation of anything that is not truthful. In the months prior, in editing, whenever I had a choice to make, I would mentally ask myself: Does this pass the Caroline Myss test? And by that, I meant, am I doing this for the right reasons? Is this creative decision based on truth or ego? I guess I was anxious about Caroline’s response because I knew she would tell me in no uncertain terms if the film was authentic or not. She would not be polite or demur – that’s not her style. She would give it to me from both barrels if she didn’t like the film. And from a technical level, she would also dismiss the film if I didn’t get intuition right. And let me tell you, intuition is a tricky subject for a filmmaker. That’s probably why a film like this has never been made before! And that’s why it took 18 months in editing to complete. The Summit screening last night in front of a room full of intuitive professionals affirmed that. Jennifer and I now leave for a 900ml drive to North Carolina to meet up with Lee Carroll, who also features prominently in the film. Lee channels Kryon. We leave Kansas City though mightly relieved. We now know for sure that the film works. That’s wonderful Bill! I’m glad it went so well and I can’t wait to see it! Thank you Emily. I wish I could show it now, but there’s still more work to be done on it – but next year! Am not surprised at the well deserved response. Wishing you the very best for the next few weeks’ meetings. This is exciting! My blog is about intuition. I can’t wait to see this movie. How will it be distributed? Hi Julia, many thanks for your comment here. What’s your blog address? I’d love to follow it. The film will be released next year, at 4:44pm on 4/4 – 4th of April. We’ll have an event premiere beforehand, most probably in Mill Valley north of San Francisco, and various Cinema on Demand screenings before the global rollout off the PGS website. Here it is! Thanks for responding. That is exciting! I live on the East Coast so I won’t be able to make it. I’m sure it will be on line at some point. Love the 4’s. Considering where you were coming from on this film, it could only BE authentic and ground-breaking as well. Michael (Michael Tamura, who is also in the film and is my husband) and I care deeply for what you are trying to accomplish since no one else is doing this quite in the way you are. I am also glad it passed the “Carolyn Myss test” – but I knew intuitively she would like it even if there were suggestions afterward for improvements from her. It is good to know from you that she is one who also doesn’t tolerate anything but the truth and full authenticity. I can only hope we are all practicing this as spiritual teachers and leaders. Thank you, Carolyn, for your unabashed discernment and for the intensive work you do in bringing truth to the world. Sending hellos to Norm Sheely as well, even if it has been many years since we have seen him. We have never forgotten you and your amazing work, Norm! Every work of art has room for improvement, just ask any artist who has trouble leaving their work alone once the piece is finished. It is said that in Japan the newspapers will always print one error on purpose so as to make the reader feel just a little more superior to the writers of articles – it gives room for the reader to see the creator of the newspaper isn’t perfect and there is always room for a personal opinion (discernment) or improvement. Good luck with the travels and we very much look forward to catching up with you along the way (in San Francisco and Germany, from what I am understanding.) Also, I wish you and Jennifer the VERY best in your upcoming engagements, I have a feeling these will all go beautifully as well. Dear Raphaelle, what a wonderful post – thank you. Sadly, not every spiritusl teacher is truly authentic. There are some out there that are in it for reasons of ego or financial gain or other dubious reasons, however my guidance kept me away from those people. I’ve only ever dealt with those that vibrate at the “shiniest” levels – and you and Michael are up there with the shiniest! Haha. Thanks also for your kind words about Jennifer and me. The Camino humbled me, making this film humbled me more. Caroline Myss the other day in her speech to the Summit exhorted everyone to “humble up!” Haha I thought that was a great way to put it! Now I try to humble up,each moment of each day. What a lovely comment !! And what an erudite one too !! Bill’s directness and honesty are impeccable. Very sweet of you to say Julian, thank you..
Congratulations- I’m very happy for you! I’ve never doubted and I’m convinced that your film will have a huge impact on mankind and will bring us all a big step forward… into the right direction! Thank you!!!! THIS Comment was meant to be a private note to Bill. Not sure how it ended up here. I had another, longer post that I was referring to in this note. Wish I could delete it, but maybe you can, Bill, sorry! Thank you Britta! You’ve been so wonderfully encouraging and supportive right from the get go! Jen and I send our love! We never doubted your film being a smashing success!! From it’s birth, development and now approaching maturity it’s been grand watching it grow. Can hardly wait for 4/4/2018 at 4:44 PM! A line is being crossed, I think this very year, where the tourigrino shall become the norm, and any “real pilgrim” or “true pilgrim” the ***unwanted*** exception. The whole “official credencial” saga is an aspect of it, just as the apparent redefinition of the parador pilgrim meals to be some sort of special reward for the 5 AM crowd rather than being the continuation in spirit of any traditional Camino Christian Charity towards the more impoverished. It’s just such a shame I ended up being physically incapable of being there this summer to witness it all first hand. Ultreia and sus eia indeed — go away, and off with you : literally. This particular pilgrimage is also extremely beautiful, albeit possibly somewhat difficult psychologically. Thanks Julian, will take a look. But what you told me when we met at La Turbie has certainly made me think! eh Bill, this is a flaw in Buddhism — it has no plan for those who are on the receiving end. Congrats on the very positive feedback on your film! My wife and I live in Kansas City and I was hoping our paths might cross while you were here, Unfortunately, we were in France on the Chemin Le Puy Velay when you were here. We are hooked on the experiences of the Camino. I continue to follow your posts and my wife and I are firm believers in intuition, We are anxiously awaiting the release of the film. That’s such a shame Brent. So close! But there’ll be other opportunities. Perhaps early next year you and your wife can organise a Cinema on Demand screening of the film! Great to see you here too posting a comment – thank you! I hope your Camino gave you everything you wanted, and more. Thanks ! My most humbling but at the same time most gratifying experience of the Parador pilgrim dinner was one night arriving in Compostela late, showing only my massive Credencial from 2000K walking, for the Pilgrim Office was long closed, penniless, being given a ticket for one, being mystified by expressions of shock from the doorman and others, collecting my grub and my wine, then walking up to discover that I was in fact an 11th Pilgrim. I took the window sill for my seat, and quickly forgot some negative reactions from a few who seemingly thought I had no right to be there. Either this or starve til morning. The love for the Camino and its pilgrims that the Parador showed me that night still shines like an evening star in the heaven of what any true pilgrim should strive for. The same evening star that taught me in 1993 that I had missed the very essentials of the Camino, and that I needed to walk from home instead, as I did the very next year. There is a high value in the traditional discipline of the Way of Saint James, and an invitation to follow that discipline is just that, an offer and a proposal ; never any form of judgment nor exclusion. It is easy to contradict Buddhism, because it contradicts itself. It is never easy to contradict the Christ, despite the fact that He contradicts Himself. The Buddhist contradiction of the Christian religion OTOH constitutes in itself the contradiction of Buddhism — a Buddhist should recognise the Spirituality of the Faith, and he should especially be at peace with this Religion. And yet he is not. The problem I have with Christianity Julian is exemplified in what you say here. You criticise other religions. Buddhism never criticises Christianity. It’s untrue that Buddhism never criticises Christianity. I shan’t point to any links though, because that would be sterile. Julian, in the spirit of spirited debate, which is what we do, I challenge you to show me any reputable practicing Buddhist who has criticised Christianity. Look to the Dalai Lama, who has only ever revered other religions. Well I don’t know if you are a practising Buddhist, but you have criticised Christianity yourself several times. But no — I think posting links would be beyond sterile, I think they’d be actively destructive. I have great respect for such genuine Buddhism as taught by the Dalai Lama for example, but not so much for certain westernised varieties, which provide IMO a greatly flawed interpretation of the spirituality, and completely misrepresent the mysticism. Julian – let’s shut this down. Let’s just agree that you have your views, and I have mine – and you won’t change my views and I won’t change yours. More importantly, this is my blog, and I don’t wish to discuss this any more. Nor do I wish you to either. More-over, I would ask that you please keep future comments on point – and don’t use it as a forum to whinge. This is not even a criticism.